Today I have a secret recipe for a delicious seafood dish served at Bonefish Grill. Marinated scallops wrapped in bacon and served with garlic sweet chili lime Sauce. Serve with some steamed rice and vegetables to complete your meal. Marinade: In the small container, mix Kosher salt, corn starch, sake, Baking soda,3 tbs water well. Add cleaned scallops (trim off the scallop ducts;the rectangle muscle that is attached to its side) and stir and put the lid on and keep in the fridge for 4-6 hours Rinse the scallops well under cold running water and pat them dry with paper towel and follow the recipe. How to assemble: Pour the sauce in the center of the plate. Take off the twine from bacon wrapped scallops and place the bacon wrapped scallops around the sauce. Drop some of the sauce on top of the each scallop. Today I have a secret recipe for a fresh and delicious seafood dish served at Bonefish Grill. Their Chilean sea bass is seasoned with fresh thyme, parsley and scallions. Wrapping the fish in parchment paper before cooking ensures a moist, perfectly cooked dish. 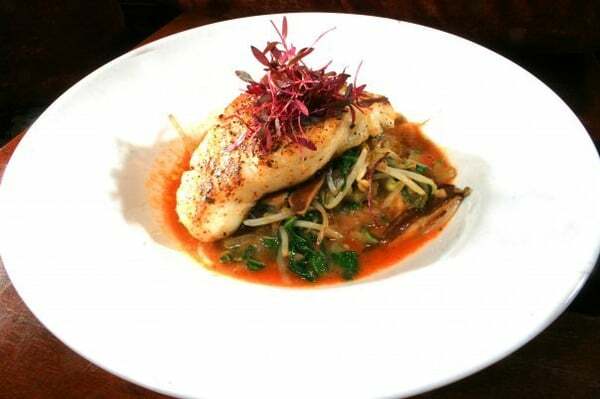 This sea bass is served with a rich tomato based broth. Prepare the broth: Pour the quart of cold water in a medium pot add all the ingredients, bring to boil and then dim the fire and let gently simmer for one hour ( if reduces too much add a little more of hot water). After the hour use an immersion blender and grind all the ingredients in the pot than let simmer for 30 min more, don’t let it reduce too much, than strain the broth with a fine strainer season as needed and keep it hot. Prepare to fish: Set on a working table one sheet of parchment paper big enough to wrap the fish filet. Put the fish filet in the middle of the parchment paper sprinkle with salt and pepper. Top the fish fillet with the thyme, the scallion and the parsley. Drizzle with the extra virgin olive oil. Wrap the fish in the parchment paper (as you were wrapping a gift). Fold one side of the paper on the other than fold the sides. Save the wrap as made in the fridge for 15 minutes. In a small pot of boiling water, blanch the sea beans for 4 minutes than shock them in iced water so they won’t loose the color. Set aside. Cook the fish in a preheated oven at 350 degrees for 13 to 15 minutes. Meanwhile reheat the sea beans in boiling water for one minute. To Plate: Unwrap the fish carefully and clean it from all the garnish used in the cooking wrap. Place the hot sea beans in a nice big pasta bowl , top with the fish and garnish with the sprouts and the nasturtium flower than gently pour the broth all around the fish. Finish with a little drizzle of extra virgin olive oil just on the fish. Today’s secret recipe will show you how to make Bonefish Grill’s oysters Rockefeller. This tasty appetizer takes fresh oysters and tops them with a kicked up creamed spinach and then baked until hot and bubbly. These are always a hit when you’re entertaining guests. Preheat oven to 350 degrees. Take the creamed spinach and combine with all ingredients listed in mixing bowl. Mix well. Place about 2 tablespoons of mixture on freshly shucked oyster. Line up oysters on tray and place in oven for 6-8 minutes or until topping is hot & bubbly. Add some crispy bacon for flavor and crunch. Bring a pot of salted water to a rolling boil. Add fresh spinach, cook for 2 to 3 minutes. Drain in strainer and press out water from spinach as much as possible. Finely chop spinach and set aside. Melt butter in medium saute pan over medium high heat. Add garlic and onions for about 2 minutes until they are soft and let off a beautiful aroma. Add the spinach to the saute pan and stir until all the liquid is released. Add cream, salt, pepper, as desired. Cook until cream is reduced to desired consistency, which will take 3 to 5 minutes. Remove from heat and get ready to stuff your oysters. My local supermarket had an amazing sale this week on jumbo shrimp which is perfect for today’s secret recipe. 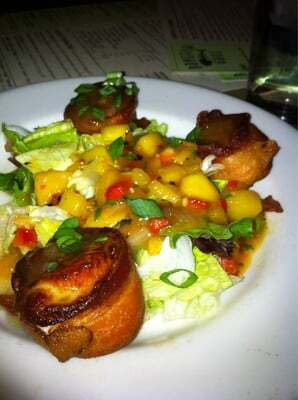 At Bonefish Grill they serve a delicious saucy shrimp appetizer. Sautéed shrimp in a creamy lime, tomato, garlic sauce with kalamata olives and topped with feta cheese. This dish combines so many vibrant flavors. You could easily turn this into an entree by serving it with pasta or rice. Heat 1 tablespoon butter and the oil in a nonstick pan over medium-high heat. Season shrimp with salt and black pepper and place in pan. Cook just until pink on both sides and remove from pan and set aside. At this point they should be somewhat undercooked because they will finish cooking in the sauce. Careful not to overcook them or they will get rubbery. Add remaining tablespoon of butter to pan along with garlic. Cook garlic for 1 minute. Add tomato paste and clam juice. Stir to mix tomato paste into clam juice. Let simmer for 1-2 minutes. Add white pepper, salt, sugar, lime juice, cream, and sun-dried tomatoes. Return shrimp to pan and add olives. Crumble feta cheese on top and serve.